After multiple delays in the official schedule, Elon Musk’s private space company SpaceX has finally decided on a date for the first-ever launch of their Falcon Heavy spacecraft. It has been confirmed that Falcon Heavy will reportedly take its ‘maiden’ flight to the deep dark dirges of space on February 6. According to an official tweet by Space founder and CEO Elon Musk, the targetted launch date for the Falcon Heavy has been set for Tuesday next week. While 6th February will be serving as the first launch window for SpaceX, they have the freedom to delay this launch until the next day if any last moment technical difficulties arise. Aiming for first flight of Falcon Heavy on Feb 6 from Apollo launchpad 39A at Cape Kennedy. Easy viewing from the public causeway. Guys… are you ready!? #FalconHeavy LAUNCH DATE! February 6th, with a backup on the 7th. This is a significant launch not only for SpaceX but the entire space industry. The Falcon Heavy, if you were unaware, will become the world’s ‘most powerful rocket’ if this launch goes without any hiccups. We’ll also look forward to how many of their three boosters is SpaceX capable of landing back safely on Earth, which adds to their USP for reusability. Chalking about the specifics, the Falcon Heavy (previously known as Falcon 9 Heavy) is composed of 3 rocket boosters — one core engine and two Falcon 9 first stages that are currently used for SpaceX launches. It stands 230-foot tall and has been primarily built to one day carry humans and undertake the journey to Mars. 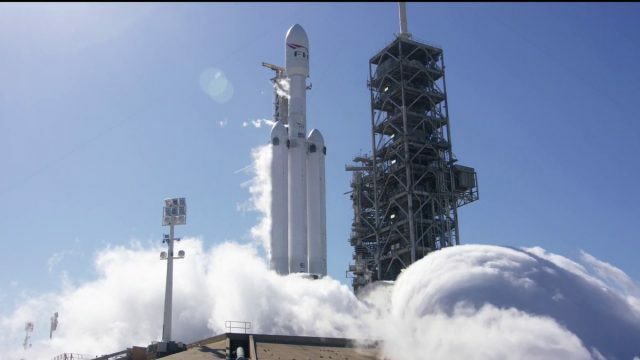 The Falcon Heavy is capable of carrying payloads weighing up to 63,800 kg (140,700 lb), which is almost thrice the maximum payload of the Falcon 9 rockets. And this has been made possible, thanks to the 5.1 million pounds of liftoff thrust that its 27 Merlin engines can generate. 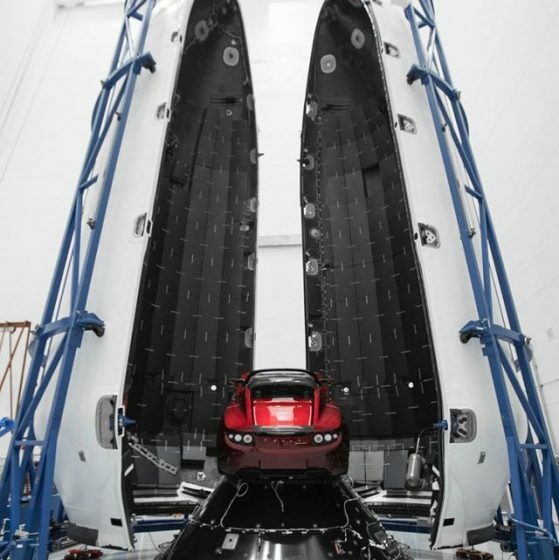 While it surely is interesting to know that Falcon Heavy will be the world’s most powerful rocket, but did you know that their dummy payload for this test launch is Musk’s own Tesla Roadster. The payload will be an original Tesla Roadster, playing Space Oddity, on a billion year elliptic Mars orbit. There’s no doubting the fact that Musk is working arduously to make space travel possible and cheaper for everyone on this Earth. The Falcon Heavy may presently come in handy to launch larger satellites to space, the end goal has been set at making humankind a multi-planetary species. So, are you as excited about the Falcon Heavy lift-off as I am? Do share your views down below.